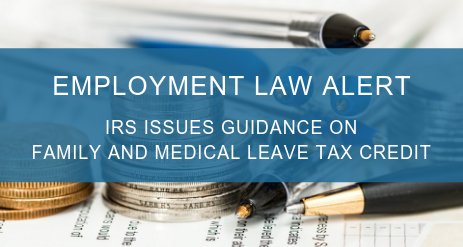 On September 24, 2018, the Internal Revenue Service issued guidance on the business tax credit for paid family and medical leave under Section 45S of the Internal Revenue Code. Section 45S, added by the Tax Cuts and Jobs Act that was signed into law in December 2017, provides employers with a temporary tax credit for voluntarily offering up to 12 weeks of paid family and medical leave to their qualifying employees. The tax credit is available to all qualifying employers for the 2018 and 2019 tax years, regardless of whether the employer or employee is covered under the Family Medical Leave Act of 1993 (FMLA). In order to qualify for the tax credit, employers must have a written policy that provides all qualifying employees who have one or more years of service with: 1) at least two weeks (annually) of paid family and medical leave for each full-time qualifying employee and a proportionate amount of leave for each part-time qualifying employee and 2) payment of at least 50% of the employee’s regular earnings while on qualifying leave. The written policy must be adopted and implemented into practice on or before December 31, 2018, to retroactively apply the tax credit for 2018. Furthermore, the tax credit may only be claimed for employees whose prior year wages were $72,000 or less. The tax credit equals 12.5% of the wages paid when the employer pays at least 50% of the employee’s regular earnings while on qualifying leave. The tax credit increases incrementally as the employer offers a larger percentage of the employee’s regular earnings, up to 25% for employers that pay 100% of their employees’ regular earnings while on qualifying leave. Paid leave such as vacation, personal or medical or sick leave (other than family and medical leave as defined under FMLA) is not eligible for the tax credit. The purposes for which the employee may take paid family and medical leave must be for the same purposes as under FMLA. Additionally, the tax credit does not apply if the paid family and medical leave is required under state or local law. Moreover, although the tax credit is available for employees not covered under FMLA, employers must include “non-interference” protections in their written policy to claim the credit for those employees. These protections ensure the employer will not interfere with an employee’s rights under the policy and will not discriminate against any individual for opposing any practice prohibited by the policy. If you have questions regarding whether you qualify for the tax credit or the impact on your business, please do not hesitate to contact us or your attorney.